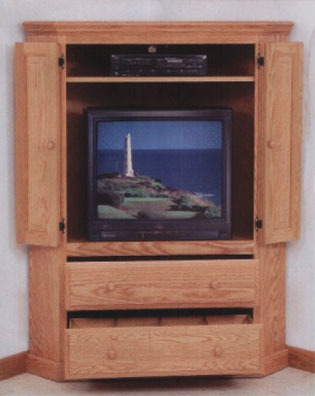 The Amish build a 2-drawer version of our 60” corner entertainment center as well, with the same footprint as the single-drawer version. This one eliminates the second adjustable shelf in favor of the second drawer, which will affect the size of the TV that you can fit in it. This is the perfect solution for someone who needs a lot of storage, but only has a small amount of audio/video equipment, although it only stands 5 feet tall, so you could put a lot on top of it. The price is even the same! It is difficult to tell from this picture if both of the drawers contain tape dividers. If this is important to you, please verify your drawer needs when contacting us, and we will be sure it comes the way you want it. Front opening is 33.5” Wide x 33.25” High - Max TV Height depends on location of adjustable shelf.